The Ocicat trademark signature is the array of thumbprint-sized spots in a bull’s eye pattern sprinkled all over the body. This agouti-spotted cat features solid muscles on a sleek, medium-sized, athletic-looking body. The Ocicat’s spotted coat comes in 12 recognized colors: tawny, chocolate, cinnamon, blue, fawn, lavender, ebony-silver, chocolate-silver, cinnamon-silver, blue-silver, fawn-silver, and lavender-silver. If you look closely, you will note that each hair contains several bands of color. Females weigh between 6 and 9 pounds and males average between 9 and 14 pounds. Wild in looks, the Ocicat possesses a tabby temperament. This breed thrives on the company of people – even first-time visitors to the home. Don’t be surprised if they are the first ones to greet guests. Ocicats revel in busy, active households and eagerly enjoy the company of other family cats, dogs and other pets. They do not like being home-alone cats and may act out of boredom and lack of regular exercise. If you are looking for a cat who will interact with you and even engage in conversation, than the Ocicat is tailor made for you. Without proper training, they can be a bit demanding. Highly intelligent, Ocicats are willing students who learn basic obedience commands and tricks easily. They are also easily trained to wear harnesses and walk on leashes. These feline athletes love to play as hunters and to leap onto very high places. The Ocicat coat is very low-maintenance and can be easily kept looking its best by rubbing a chamois across it once a week to remove dead hairs. 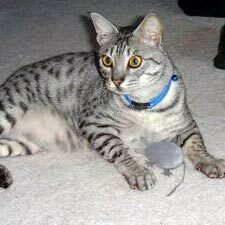 Keep items you don’t want your nosy Ocicat to find behind locked doors or cabinets with childproof latches. Prone to gingivitis, this breed benefits by having you brush its teeth on a regular basis to prevent tartar buildup. This cat evolved from taking the best of two popular breeds: Abyssinians and Siamese. In 1964, Virginia Daly, a cat breeder from Berkeley, Mich., bred an Abyssinian with a Siamese and produced a litter of ticked-coated kittens. The second litter produced a male kitten with a wildcat-looking spotted cat who she named Tonga. Further cross-breeding with these two breeds plus the American Shorthair led to the creation of the Ocicat breed. Tonga was the first Ocicat shown at a CFA show in 1965, but the breed itself went into a temporary hiatus for 11 years while Daly, regarded as its main breeder, took time to care for a sick family member. She returned to breeding Ocicats in the early 1980s and the breed has steadily grown in popularity worldwide ever since. Now ranked 18th in popularity among the CFA-recognized breeds, the Ocicat was granted championship status in 1987.